Canadian talent shone as brightly as the stars over Britannia Bay at the 12th annual CKCU Ottawa Folk Festival.Willie P. Bennett, the Jim Cuddy Band and Natalie MacMaster reminded us why our folk tradition is so worthy of our support. Celebrations for the 25th anniversary of Canadian Spaces, the longest-running folk radio show in Canada echoed this sentiment. Chopper McKinnon and Karen Flanagan McCarthy returned to host the main stage throughout the festival. Some controversy arose over the appearance of Alberta singer-songwriter Kalan Porter, who won the Canadian Idol competition in 2004. Porter was seen as a pop performer rather than a folk performer by some people. But Porter, who is classically trained, held his own when he performed on the main stage and in a workshop. Peter Katz and Layah Jane were co-winners of the Galaxie Rising Stars Award. They were presented with the award on the CUPE Main Stage on Saturday evening by Roch Parisien, music programmer for Galaxie’sFolk Roots channel. Katz and Jane shared the award and a $1,000 cash prize. Also on Saturday, the wonderfully named Terry Joe Banjo was given the One Fret Less Award and a $1,000 cash prize. This award is made possible by a Community Foundation of Ottawa endowment established byHarvey and Louise Glatt, long-time supporters of folk music and singer-songwriters. The winners wereselected at the annual auditions held at Rasputin’s Folk Café and the NAC Fourth Stage. Other features at the festival were the artisans at the Craft Village, who offered a wide array of handmade items, ranging from pottery to furniture to jewellery. 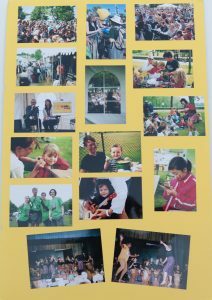 The ever-popular CKCU-FM Family Area presented musical performances, craft workshops, face painting and a puppet playhouse. The CKCU-FM Stage featured music, dancing and magic shows. The Family Craft Area had workshops led by festival artisans. Participants could make colourful hats and percussion instruments for the Sunshine Parade on Sunday evening. The CUPE EnviroTent offered environmental demonstrations and discussions. The festival continued its green initiativeswith reusable plates in the Food Court. A beer cup recycling program was created by the CKCU Ottawa Folk Festival and Arbour Environmental Shoppe. Prizes including a rain barrel from Arbour. Tickets to upcoming folk festival concerts were offered to participants of the beer cup recycling program. A festival documentary film, River Tales, created by Gemini Award-winning filmmaker Scott Troyer and journalist Rose Simpson was shown in the Ottawa and District Labour Council tent. 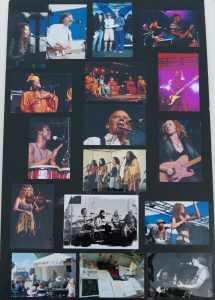 The film looks behind the scenes at the 2004 Ottawa CKCU Folk Festival, and includes interviews with organizers, volunteers and artists such as Judy Collins, Arlo Guthrie, Michael Franti and Jackie Washington. The documentary creators were available on Saturday and Sunday afternoon to chat with viewers. Of course, Arthur McGregor, owner of the Ottawa Folklore Centre, opened the festival with his customary acoustic stringed instrument rendition of our national anthem. The first evening of the 12th CKCU Ottawa Folk Festival was graced with an inspired set by veteran Canadian performer Willie P. Bennett, who was presented with the Helen Verger Award. Bennett performed with aplomb. He kept the audience entranced with a crowd- pleasing cross-selection of material from his long musical career that stretched from the mid-70s to the present day. This performance is a special memory for his fans as he tragically passed away in 2008 at the age of 57. The lively Quebec trio Genticorum performed with their blend of traditional music and original songs delivered with strong vocals and an impressive range of acoustic instruments. Halifax roots-rocker Joel Plaskett, whose album Truthfully Truthfully was named best rock recording at the 2005 East Coast Music Awards, gave a heartfelt and well-received performance. The esteemed American folk performer Eliza Gilkyson treated the audience to a set showcasing her poetic and sometimes political folk tunes. Following Willie P. Bennett’s performance, the amazing veteran British performer Joan Armatrading closed the evening with a high-energy set that had the audience dancing beneath the stars. This Member of the Order of the British Empire is a singer-songwriter who plays a mean guitar. Armatrading performed many of her hit songs such as the evocative “Show Some Emotion” as well as newer material. On the Nutshell Music & Event Management Stage, renowned drummer/percussionist Derek Debeer led aCommunity Drumming Jam. Many local drummers participated while the audience got into the groove. Debeer was born in Rhodesia (now Zimbabwe). He is well known for his work with Johnny Clegg, and withClegg’s bands Savuka and Juluka, both of which celebrated African rhythms. The Texas based duo The Dreamsicles (Cary Cooper and Tom Prasada-Rao) gave us a set of sassy and sweet love songs. Lucie Idlout, a powerful Inuit performer from Nunavut who spent many years living in Ottawa, mesmerized the audience with her hard-hitting and emotional tunes. American singer-songwriter Chuck Brodsky performed a set that showcased his diverse repertoire of funny and touching story songs. The Weakerthans were up next with a set that incorporated rock, folk and alt-country with lyrics with a literary bent. Feist wowed the crowd with a dynamic and danceable set. The Calgary singer-songwriter’s performance featured intimate lyrics, catchy melodies and her seductive, haunting voice. Alternative rock band The Jim Cuddy Band includes the co-founder of Blue Rodeo along with Bazil Donovan, Anne Lindsay, Joel Anderson and Travis Good. The band country-rocked the park with original tunes by Jim Cuddy and Blue Rodeo standards. It was wonderful to see Anne Lindsay having such a great time playing her fiddle! The Beth Ferguson Award was presented to 16-year-old Meredith Luce who received a bursary and an original painting by Geoff Sangster. The award is presented to an Ontario female songwriter under the age of 30 in memory of Beth Ferguson (1953-1999) who was greatly admired for her body of work as a solo singer- songwriter and as a member of the a capella group Malaika. Alternative evening programming also took place on the Kershman-Wasserlauf Stage. Catherine Burns,the regular caller for Ottawa’s monthly Old Sod contra dances, performed those duties at a Contra Dancefeaturing Genticorum. Beginners were welcome and instruction was provided. Offsite, After Hours Folk at the Travelodge Hotel’s Beachcomber Room featured New Brunswick trio Hot Toddy and Edmonton’s Painting Daisies, as well as a midnight set with country rebels The Swiftys. Things got off to an inspiring start on the CUPE Main Stage with a Gospel Sing featuring Linda Tillery & the Cultural Heritage Choir, Penny Lang and host Ken Whiteley. There was more inspiration at the Sources of Inspiration session featuring Lucie Idlout, Harmony Trowbridge, Jason Fowler and host Anne Lindsay.Genticorum hosted Vocal Focus with Linda Tillery & the Cultural Heritage Choir. Ron Moores, host of the CKCU-FM old time country show The Back 40, led Back 40 Live, Part 1. His country dream team includedThe Dreamsicles, Crescent and Frost, and Sarah Lee Guthrie & Johnny Irion. On the Bowie Electrical Stage, the fun began with a concert showcasing the talents of Peter Katz. ThreeTaking Turns sessions featured Crescent and Frost and The Swiftys, followed by Tito Medina andCasadore, and ended with Layah Jane and Meredith Luce. Cam Wells hosted the Musical Friends session with Chris Frye, Dave Clarke and Penny Lang. Folka Voca, a community choir led by Lee Hayes opened the day with a concert of popular contemporary tunes at the Kershman-Wasserlauf Stage. Dave Clarke hosted Expect the Unexpected with Hot Toddy and storyteller Ruth Stewart-Verger. The National Arts Centre sponsored Alberta Scene Revisited withKehewin Native Performance, Painting Daisies, The Swiftys and host Jen Covert. The NAC had presented several Alberta performers in its Alberta Scene series earlier in the year. H’Sao got the crowd up dancing with the Danse africaine session. More dance opportunities followed with a Latin Dance Party featuring Joaquin Diaz. The Nutshell Music & Event Management Stage entertainment began with a concert with Crescent and Frost. The Guitar Tales session featured Yann Falquet of Genticorum, Stephen Carroll of The Weakerthans, and host Rachelle van Zanten. The Rural Roots session featured Feist, Concession 23 and host Chris Frye. A collaboration of musical styles was presented when the Blues Meets Jazz session showcased Hot Toddy, Grant Stovel of The Swiftys, and host Ken Whiteley. Chopper McKinnon hosted Canadian Spaces Live with Ken Whiteley, Harmony Trowbridge, Meredith Luce and Arthur McGregor. This session had particular significance as it was the 25th anniversary of the CKCU-FM show Canadian Spaces. A concert with Casadore was the first performance on the Crosstown Traffic Stage. The Story Songs and Song Stories session included musical storytellers Chuck Brodsky, Penny Lang and host Dean Verger. TheGalaxie Rising Stars session hosted by Roch Parisien showcased the music of Layah Jane, Peter Katz andJoe Grass. CBC Fuse featured John K. Samson of The Weakerthans, Feist and co-hosts Amanda Putz andBill Stunt. Festival Director Gene Swimmer hosted President’s Choice, a session with Anaïs Mitchell, Tom Prasado-Rao and Chuck Brodsky. Great choices, Gene! At the Rogers Stage, the Canadian Woman session hosted by longtime festival volunteer and journalist Rachel Hauraney started things off with Harmony Trowbridge, Lucie Idlout and Daisy Blue Groff. Following a concert with Kehewin Native Performance, it was time for the Americans to get into the act with theAmerican Woman session. This session was hosted by Angela Page and presented Anaïs Mitchell, Cary Cooper, and Sarah Lee Guthrie & Johnny Irion. Anne Lindsay and Genticorum alternated in the Taking Turns session. The day’s entertainment ended with a concert with Linda Tillery & the Cultural Heritage Choir. 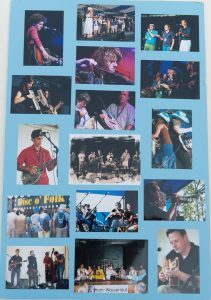 Bluegrass and blues music were the themes in the OFC Music Tent. Performances by bluegrass artists Leavin’Train, Jan Purcell & Pine Road, Handsome Molly and Concession 23 were followed by blues musicianMiles Howerd and friends. The participatory sessions on the Ottawa Folklore Centre Stage got off to a lively start with the Rise Up Singing session led by Arthur McGregor. The session was named for the popular folk music songbook. David Keeble hosted the Songcraft session with Pat Moore, Lee Hayes and Tom Lips. Miles Howe led a crowd with his Harmonica Basics workshop, while Terry Joe Banjo hosted the Banjo Basics session. Folka Voca, a community choir led by Lee Hayes, gave a concert. The Terry Penner Festival Choir held its first rehearsal. The session Spotlight on the Diddley-Bow with Crescent and Frost focused on the unusually named instrument the diddley bow, which is a single-stringed American instrument that influenced the development of blues music. For the Love of Music with Kindermusik was the first bit of fun on the CKCU-FM Stage. Other children- oriented material included Kid Stuff with Rich Hinman of Crescent and Frost and Magic for Kids with Doctor Magic (George Sapounidis). After a Traditional Dance performance with Kehewin Native Performance it was time for the Taking Turns session with David Keeble and Tom Lips. The day ended on a relaxed note with a Balance and Stretch session led by the Taoist Tai Chi Society of Canada. The Family Craft Area featured workshops with Bead-y-licious, Jason Bellchamber Celtic and Medieval Goldsmith, Barefoot Toys, The Leathersmiths and Emily Wood. Participatory environmental demonstrations and discussions took place in the CUPE EnviroTent. The topics included the upcoming pesticide decision in Ottawa, building a home from car tires, human-powered vehicles, how to make biodiesel fuel, and trading fairly. 17 Maple Blues Awards. Linda Tillery & the Cultural Heritage Choir is a six-voice ensemble from San Francisco whose mission is to preserve Black American music. They performed a variety of percussion-driven vocals rooted in the deep South and in their West African and Caribbean traditions. Canadian favourite Natalie MacMaster had the crowd buzzing with her high-energy performance of Cape Breton fiddle music. The evening ended on a soulful note with Hothouse Flowers, a Dublin-based band that has been described as “Ireland’s finest folk-rock export” by BBC Radio. Alternative evening programming included the Alt-Folk Café on the Kershman-Wasserlauf Stage featuringPainting Daisies (hosts), Harmony Trowbridge, Anaïs Mitchell, Layah Jane, Meredith Luce and Peter Katz. After Hours Folk at the Travelodge Hotel Ottawa West showcased Crescent & Frost, Lucie Idloutand The Weakerthans. On the CUPE Main Stage, The Black Sheep Live session was hosted by Paul Symes, owner of the Black Sheep Inn in Wakefield, Quebec. It featured Ana Egge, Jeremy Fisher, Chris Smither and The Swiftys.Laurie-Ann Copple hosted the next session, Words and Music, featuring Jason Fowler, Doreen Stevens, The Dreamsicles and Arthur McGregor. Humour was the theme of the next session, titled A Funny Thing Happened. Fun-loving performers were The Arrogant Worms, Jean-Marc Lalonde, Chuck Brodsky and host Carolyn Sutherland. Folk enthusiast Mike Regenstreif hosted the Musical Influences session withNatalie MacMaster, Anne Lindsay, Kalan Porter and Derek Sharp. The Bowie Electrical Stage had four Taking Turns sessions: Terry Joe Banjo and Jean-Marc Lalonde; Anaïs Mitchell and Ana Egge; Concession 23 and Hurry Up and Wait; and Jeremy Fisher and Harmony Trowbridge. Guitar Styles was the theme of the first presentation on the Kershman-Wasserlauf Stage. Michel Dozoishosted the session, which featured Tony McManus, Jason Fowler, Slavek Hanzlik and Dave Clarke. There were two Cross-Cultural Sound Exchange sessions. The first featured Mushfiq Ensemble, Anne Lindsay, and the George Sapounidis Ensemble. The second showcased Mushfiq Ensemble in a second appearance,Derek Debeer and Tito Medina (host). There was also an African Roots session with Baobab Tree Drum Dance Community, hosted by Linda Tillery & the Cultural Heritage Choir. The Wailin’ Jennys hosted People and Places, the first session on the Nutshell Music & Event Management Stage, featuring Chuck Brodsky and Chris Frye. The Wailin’ Jennys, whose name is a play on the name of country star Waylon Jennings, returned for the second session, Rasputin’s Live. It was hosted by Dean Vergerand also showcased the talents of Rick Fines and Ian Robb. The Life Changes session included performances by Anaïs Mitchell, storyteller Ruth Stewart-Verger and Penny Lang, and was hosted by Karen Flanagan McCarthy. The Country Style session featured music that was just that and included Slavek Hanzlik and Dave Clarke, Pat Moore, Hurry Up and Wait and host Zita Murphy-Brascoupé. At the Crosstown Traffic Stage, the Doc’s Pick session, named after a regular segment on the CKCU-FM folk show Canadian Spaces, was hosted by Doc himself (Peter Conway of McCrank’s Cycles, a local business that is a longtime sponsor of the show). The session included Rick Fines, Joe Grass and Sue Foley. Things took an historical turn with the Ottawa 150 Anniversary Celebration featuring Alex Sinclair, Jean-Marc Lalonde, 7IM-VWA, Jim McIntyre and Victor Emerson (host). Shades of Blue was the theme of a session hosted byRick Fines and featured Sue Foley and Joe Grass. The day ended on a philosophical note with What Was I Thinking? 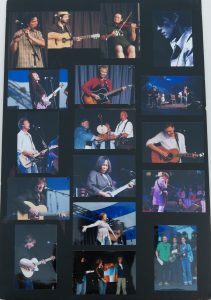 Lighthearted responses were provided by participants including The Arrogant Worms, Lee Hayes, Alex Sinclair and host Bruce Steele. Songs for the Earth was the first offering on the Rogers Stage. Hosted by Arbour Environmental Shoppeowner Sean Twomey, the session featured the talents of Doreen Stevens, Alex Sinclair, Chris Whiteley andThe Dreamsicles. Songs of Hope and Freedom was an inspiring session with Linda Tillery & the Cultural Heritage Choir, The Original Sloth Band, Sarah Lee Guthrie & Johnny Irion, and host Morna Ballantyne. Music from the Glen was a session named for the CKCU-FM British traditional music show. It was led by the show’s host Gord Peeling and included Tony McManus, Ian Robb, Genticorum and Natalie MacMaster. Ron Moores, host of the CKCU-FM old time country show The Back 40, hosted Back 40 Live, Part 2 with The Swiftys, Southside Steve Marriner and Genticorum. Bluegrass and blues music were again offered in the OFC Music Tent. In four separate sessions, performers Jan Purcell & Pine Road, Concession 23, Handsome Molly and Leavin’ Train treated us to bluegrass performances. Miles Howerd performed with friends in the second blues session. At the Ottawa Folklore Centre Stage, first up was the Terry Penner Festival Choir Rehearsal. The Taking Turns session saw Chris Smither and Joe Grass delighting the audience with their original tunes. After anotherFestival Choir rehearsal, the George Sapounidis Ensemble performed in the session titled A World of Music. The CKCU-FM Stage kicked things off in the Family Area with Kindermusik in the session For the Love of Music. The Taoist Tai Chi Society of Canada presented a Balance and Stretch session. The Kid Stuffsession featured Terry Joe Banjo. Chris Frye joined hosts The Original Sloth Band in the Jazzin’ It Upsession. The Moving to the Beat session showcased Baobab Tree Drum Dance Community. This group led the annual Sunshine Parade, a happy and noisy celebration that wends it way from the Family Area to the main stage. Children and adults are encouraged to dress up and march along, making as much noise as possible with a variety of percussion instruments. The Family Craft Area gave children the chance to create their own treasures. Participants included Brighid’sBard (papier mâché vases), Emily Wood (bubble play), Filament (flip-flop necklaces with beads and wire), The Leathersmiths (custom leather keychains and barrettes) and Barefoot Toys (traditional wool felt mats). More participatory environmental demonstrations and discussions were held in the CUPE EnviroTent. The topics included Keeping Rivers Healthy (Ottawa Riverkeeper), Safe Alternatives to Pesticides (Coalition for a Healthy Ottawa), Renewable Solar and Wind Power (Arbour Environmental Shoppe), The Peace Kitchen Project (Ottawa Peace Kitchen) and The Ethical Consumer (Peri Dar). The entertainment began with The Original Sloth Band, a folk-rock group that formed 40 years ago in North York, Ont. featuring brothers Chris and Ken Whiteley and Tom Evans. They were joined onstage by Bucky Berger and Victor Bateman on drums and string bass. Next up was Tony McManus, a virtuosic Celtic guitarist who performed songs that incorporated tunes from Cape Breton, Scotland and Brittany. The popular group Painting Daisies dazzled the crowd with its incredible harmonies, inspired instrumentation and heartfelt lyrics. The Terry Penner Festival Choir, whose members included festival goers who come together at each festival, performed to an enthusiastic audience. Festival favourites The Arrogant Worms injected laughter andlevity to the evening’s entertainment with their humorous songs and onstage antics. Vancouver-based Jeremy Fisher spent the last four years touring and performing across the country travelling by bicycle. He performed a spirited set that had toes tapping. The evening ended with Kalan Porter who gave us a set that incorporated covers, original tunes and fiddle playing. He was a delight to the hordes of teenage fans who were on hand. Alternative evening programming on the Kershman-Wasserlauf Stage featured a blockbuster Super Sessionwith Rick Fines (host), Penny Lang, Slavek Hanzlik, Dave Clarke, Chris Frye, Rachelle van Zanten andJoe Grass. The Festival Wrap-Up Concert was held at the Black Sheep Inn in Wakefield, Quebec and showcased the talents of The Dreamsicles and Painting Daisies.